Time To Sign Up for Preschool! 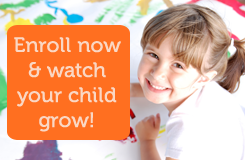 Registration for the 2014-2015 school year is going strong, but we still have spots available. We can accommodate schedules, so if your child needs 5 mornings a week, or both morning and afternoon on MWF, let us know. Call 484-7412 or contact us through the website for more information. Registration for the 2014-2015 school year is going strong, but we still have a few spots left. If you’d like more information about our school, or would like to come in and take a look, please email us through this site or call 484-7412.